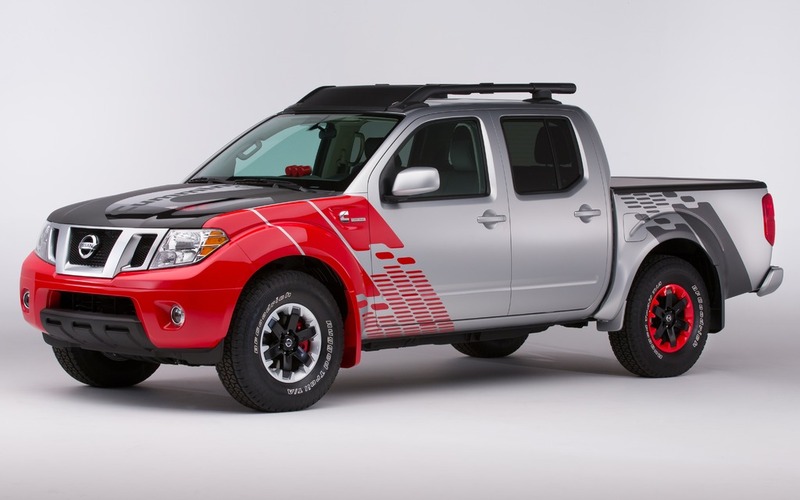 Developed from Nissan’s 4x2 Frontier Desert Runner, this new version with a diesel engine is designed to make the rounds of auto shows to gauge public opinion prior its release in North America. It arrives six months after the announcement of a Nissan partnership with Cummins Inc. to provide a 5.0-litre turbo diesel V8 in the next-generation Titan full-size pickup, which will arrive in calendar year 2015. The colorful, two-tone bodywork gives it a more attractive style. In addition, the central part of the hood is transparent so that we can admire the new diesel engine. Also: Nissan NV200: The Taxi of the Future? This engine is a 2.8-litre four-cylinder Cummins delivering 200 horsepower and 350 lb-ft of torque. It’s mated to an automatic ZF 8-speed transmission. Nissan says the setup is up to 35% more economical compared to the standard 4.0-litre V6. The 16-inch wheels, borrowed from a Frontier PRO-4X, have been treated with a special two-tone paint – Arrest Me Red for the rear wheels and silver in front, each accented by satin black paint. The brake calipers have also been custom painted in contrasting colours – silver rear and red front. The Frontier Diesel Runner’s interior mirrors the silver and red exterior design, with red accents throughout and carbon-trimmed seats and panels. The front and rear seats feature carbon-print leather appointments with grey accent stitching and black-on-black “Tracks” embroidery. The carbon film-wrapped instrument panel is highlighted by red-tinted gauges and a special black-faced diesel-specific three-gauge pod on top of the C-cluster. You can catch the Frontier Diesel Runner at the Chicago Auto Show from February 8 – 17. Montreal Nissan NV200: The Taxi of the Future?